During the winter months, a Willow Ptarmigan has plumage that is white in color to protect it from any predators and during the summer its coloring is a mixture of reddish brown and white. On the icy tundra in Churchill, Manitoba, a Willow Ptarmigan is barely visible in this picture as it blends in with the landscape. 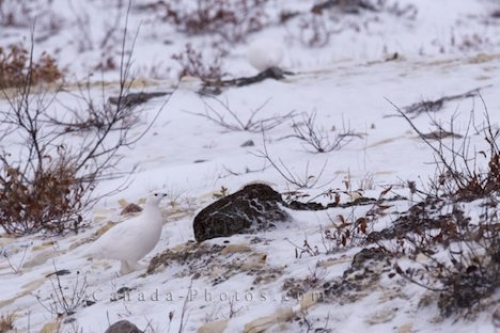 Picture of a bird known as the Willow Ptarmigan during the winter months around the Hudson Bay in Churchill, Manitoba.